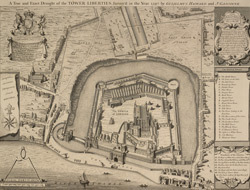 This bird's-eye view of the Tower of London and its 'liberties' was published by the London Society of Antiquaries under the direction of John Peyton. The plan's title features along the top, with a description in a banner at top left, below the Royal Arms. The compass star is at left centre, with scale bar and dividers at bottom- and top-left. A reference is included table down the right side of the plate, with notes on the Liberty's territory and boundaries. The term 'liberty' refers to the area under the Tower's independent jurisdiction. This is a 1742 copy of an original 1597 plan was first published in 1597. Until James II's charter of 1686, the liberties of the Tower were restricted to the area within its walls and the land on Tower Hill. Three territories were added by James II: the Minories, the Artillery Ground and the Wellclose.